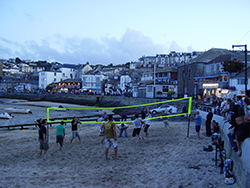 There are plenty of opportunities for both playing and watching sport in St Ives - on both land and water. All welcome new members, visitors and spectators. For details see the listings below. Each has a link to the club website where you can find more details and the latest news. Located on the edge of town at the top of The Stennack. They play both first team and youth matches throughout the season. Their ground has plenty of parking and is served by buses from the town centre. If you want to travel on foot it is a ten minute walk from town - but it is all uphill ! They have a spacious clubhouse with good facilities including bar, function room and ballroom. As well as rugby they run a number of social events and cater for private functions. The club play at St Ives School at The Belyars with matches both midwwek and on Sundays during the season. 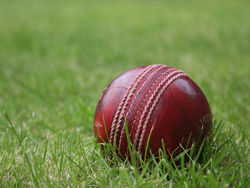 They currently have three teams that play in the Cornwall Cricket Leagues. Their website has details of teams, fixtures, match statistics and the latest club news. 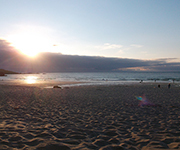 Located overlooking St Ives Bay, the club probably has one of the most beautiful settings anywhere. It was voted one of the twenty best clubs in the UK by ACE Magazine. 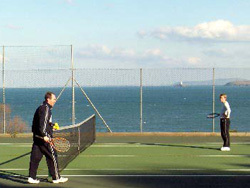 Courts are available for public hire from the Porthminster Hotel between 9.00am and 4.00pm, Monday to Friday. Other times are for members only but subscription fees are very reasonable and they welcome new members. They play team tennis in the local leagues during the summer, and there is also a winter league. Members meet for social tennis on Wednesday evenings and Sunday mornings. 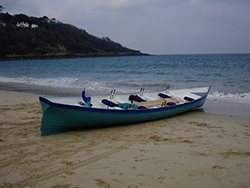 The club is based near St Ives Harbour and they sail through the spring and summer on Wednesday evenings and Saturday afternoons. 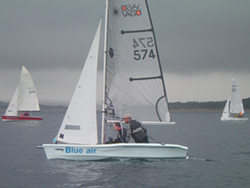 Whilst the primary activity of the club is racing, they set aside a number of days each year for 'Fun' sailing, when they can take friends and family out into the bay - and try to find some dolphins! As serious as the racing sometimes gets, they are essentially a small and friendly club, and visitors are always welcome. If you are already a sailor, holidaying in the area and wish to bring your boat, please come and join them on race days. They can sometimes find space in the pen for an extra boat or so, and like racing against new faces (unless you're too fast!). Most seaside towns in Cornwall have at least one Pilot Gig. St Ives has two gigs - 'Porthminster' and 'Defiance'. The club was formed in 1990 by a group of local people keen to join in the revival of a very Cornish tradition. They bought their second gig 'Defiance' in 1997, she is a lighter boat than 'Porthminster' and is the one they take almost every weekend to race somewhere in Cornwall. They love to row and love the excitement of racing, six rowers and their cox, in a wonderful traditional Cornish craft. They welcome new members so why not join them and give it a try? 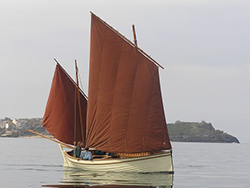 A group dedicated to reviving the racing class of Jumbo Fishing Luggers - first launched in the 19th Century. 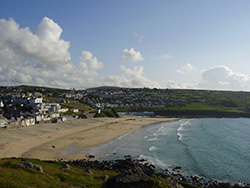 Races will take place during the summer in St Ives Bay. Their website has more details and information about how you can support their fundraising. Would you like a full listing for your sports club here ?